Electrical tech is confusing! And when you think your battery is acting funny, it can be a real problem to figure out the cause. Optima batteries are different from a traditional battery because of their construction, but you can still figure them out with a couple of tools. In this article, we'll take a look at how to determine whether your Optima is bad, whether it's salvageable, and why you might need a special charger or traditional battery to recharge it. Optima batteries work a lot like regular batteries with some added features. A dark-cased RedTop or BlueTop Optima is a starting battery. Starting batteries are designed to be discharged a little, then be charged up fairly quickly by your charging system. Basically, the starter skims off some electricity from the battery for starting, and it's rapidly refilled once you start up. A light-cased YellowTop or BlueTop Optima is a deep cycle battery. Deep cycle batteries are designed to be discharged a lot, then charged up. In this case, a winch, a stereo, or an on-board 12V fridge scoops a lot of electricity from the battery, and then it's refilled by your charging system. Make sure you choose the right Optima battery for what you need. You're going to need a couple of things to check your Optima. First, you need a multimeter or voltmeter. It needs to measure battery voltage, so you'll want to set it correctly. Most multimeters have a "20 VDC" position, and that's where you want to be. Warning! You need to take fairly accurate readings of your Optima's voltage. We've found that some of the cheaper multimeters out there aren't always very accurate (like that free one from Harbor Freight) so keep that in mind if your readings are right on the edge of a zone. It's helpful to have a vehicle so you can load test the battery, plus a helper. Lastly, you should have a charger that charges AGM batteries. Many people don't know this, but a conventional battery charger won't work with an Optima battery that's discharged below 10.5V. You can also use a regular battery charger with a regular battery to charge an Optima. Read more on that below. For some reason, many of us overcomplicate our solutions and diagnosis of problems (We do it here at Roundforge too!). Checking any grounding straps - these will often go from the engine block to the body and/or from the engine block to the frame. Sometimes they are bare wire. Clean corrosion with sandpaper so that you connect to clean, bare metal. Use a wrench to make clamps and other connections reasonably tight (but not so tight that you damage a battery post!). Bad connections and particularly bad grounds are one of the easiest problems to fix but often one of the last things that we check! Always check your connections first! Before you start, make sure your Optima is "charged". What we mean by this is that it should be in whatever state you think is charged, whether that means that it's been on a charger for a bit or that you just drove around for a while. To begin, switch your multimeter to 20VDC or whatever will get your multimeter reading somewhere in the range of 12 volts DC. Put the red probe on the positive Optima terminal and the black probe on the negative Optima terminal. Anything in this range means that you have normal charge and you're in the right range for an Optima. If your Optima is in this range and you think it should be charged, it's not taking or not holding a charge. This usually means that your battery is sulfated, which happens when it sits for a long time (not charging) or is deeply discharged when it shouldn't be. Or it's just old. This is highly discharged but usually still recoverable. 0 volts usually means that you've got a short somewhere in the battery - it'll need to be replaced. If it's reading a low voltage, it's probably sulfated and probably needs replacement. If your Optima's voltage is okay, it still might not perform well under load. You can load test it by going to an auto parts store (they all have battery testers nowadays) or do it yourself with a multimeter. Like before, your multimeter will be set to 20VDC, or whatever gets you in that 12 volt DC range. Touch the red probe to the positive terminal on the Optima and touch the black probe to the negative Optima terminal. Watch the multimeter as the starter motor is turning, not when you're started up! The voltage on your Optima should read 9.5-10.5 volts for at least 30 seconds. When the starter motor is turning over the engine, that is the heavy load we're using to see how the battery performs. Once started, the alternator will start push the voltage up - we aren't interested in alternator voltage since that tells you about charging, not the condition of your Optima. A warm battery can expand inside and things that should touch don't touch anymore. Similarly, terminal contacts can break or crack internally. When cold, they may touch and flow current, but when they warm up they break contact. Normal chargers won't always work with an Optima battery. It depends a lot on how deeply it's been discharged. The reason for this is simple - Optimas are AGM batteries and AGMs have a very low internal resistance. The low internal resistance allows them to put out a lot of electricity and be discharged more than a regular battery. (Although repeated discharging a dark-cased RedTop or BlueTop is not good for longevity). When a regular battery charger is hooked up to an Optima, it often won't even turn on - while the Optima could be charged, the charger thinks it's totally kaput (like a regular battery would be) and doesn't even come on. This usually happens when the Optima measures around 10.5 volts. This is the easiest way to charge or maintain an AGM battery like an Optima. The general concept here is that you charge the discharged "regular" battery with the battery charger, but you also hook up the Optima to piggyback on the regular battery. The charger sees the voltage in the Optima as too low to charge. The regular battery has a higher voltage, but still needs to be charged - the charger will want it to be at least 12.7 volts. This is not too low to charge, so the charger will turn on and flow current. By attaching the Optima to the regular battery, we can draw off some current to charge the Optima. The goal here is to get the Optima up to 10.5 volts, then hook it directly to your charger. Connect the charger to the regular battery and turn it on. Wait and hour and check the Optima. If it's hot to the touch or gassing out the vents, shut it down! The battery is no good. Warm to the touch is okay. At this point you're going to start checking the Optima's voltage frequently for the next hour. 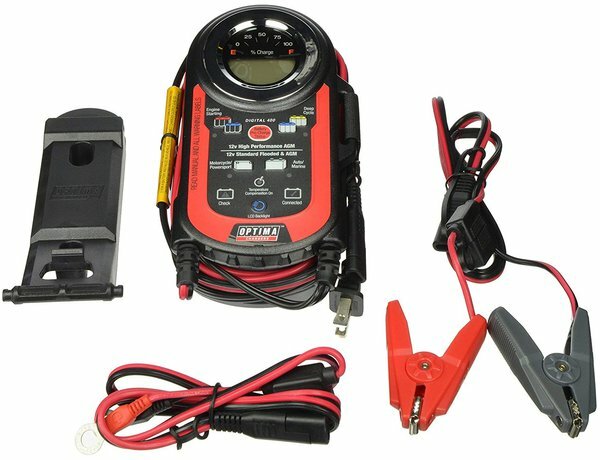 Once it reaches 10.5V on your multimeter, turn off the charger and disconnect the regular battery. Hook the Optima battery to the charger and charge as normal. The process to get to 10.5 V should not take more than a 2 hours.